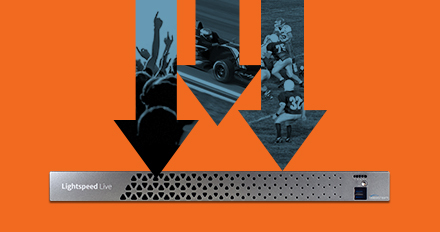 Lightspeed Live Capture is a scalable, multi-channel on-premise capture solution for ingesting live, live linear or tape-based media directly into production, post-production and broadcast workflows— and perfect for Edit@Home real-time remote production. To discuss your needs or try all of the features of Lightspeed Live Capture: contact sales or find a reseller. PRG saved time, money, and resources during a major, worldwide concert tour. Read the case study to find out how. How Lightspeed Live Capture sets itself apart. 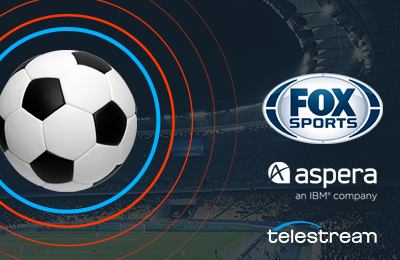 Learn how Telestream & Aspera revolutionized remote live sports production for Fox Sports. Deliver live video content and give consumers a reason to subscribe and stay. Get the eBook to find out how. 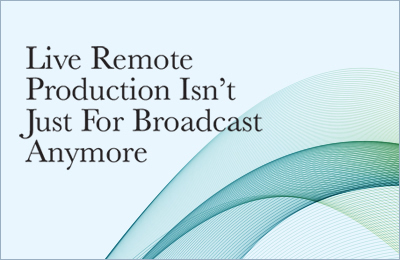 Scalable, automated, multichannel IP and SDI capture solution for ingesting live or tape-based media directly into production, post-production and broadcast workflows. 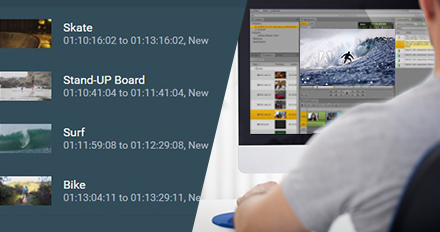 Lightspeed Live Capture processes video in 16-bit space to preserve total source quality and it records in wide variety of mezzanine file formats for delivery to local shared storage, CIFS, FTP, S3, Aspera and more. Designed with a simple, intuitive web-based, HTML5 compatible user interface. Allows for complete control or remote management from any web portal and scales easily for large system deployment. Built-in calendar, scheduling and Web Services API make setting up ingestion and capture events extremely easy. Record into enterprise-class codecs and containers ready for any workflow. 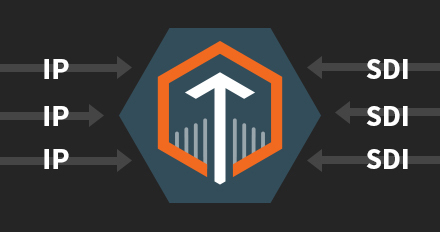 Programmatic content insertion allows you to add custom leaders, trailers or fills. Support for MPEG2 TS, DNxHD/HR, AVC Intra, Apple ProRes, XDCAM, HEVC, MXF OP1a, TIFO, and many more. Deliver files to open workflows via growing capture, write to onboard RAID or shared network storage, file-delivery services via Aspera, S3, FTP servers, or CIFS. 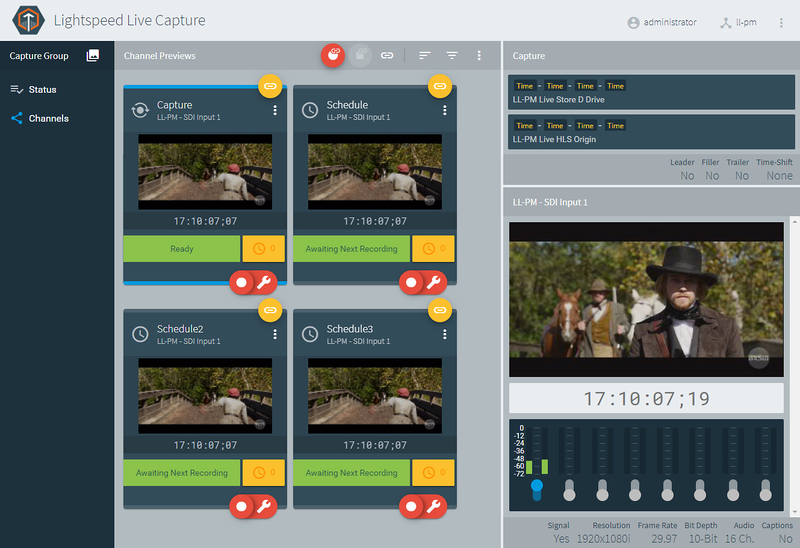 Lightspeed Live Capture allows you to check your captured assets (even if they’re still capturing) directly into Avid or Adobe-based NLE systems. Whether your editors are using Interplay or just Media Composer or Adobe CS, they can grab growing files captured by Lightspeed Live Capture and begin editing right away. No need to wait, no need to change your post-production workflow – your turnaround time just got faster. 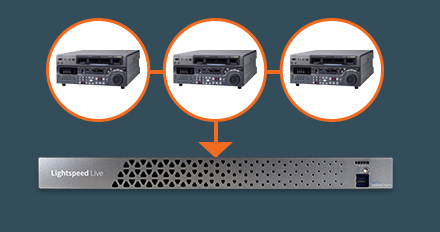 Capture and process of up to four 3G-SDI inputs or a ganged UHD or 4K signal while also ingesting multiple MPEG-2 (SPTS, MPTS) and RTMP sources all within a single, compact 1RU server. 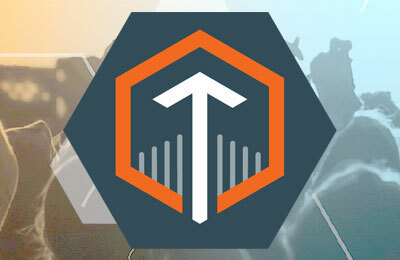 Combine multiple units together to build a capture farm that can be run and managed remotely. 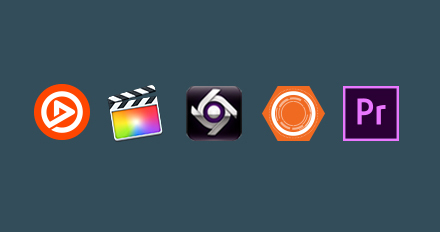 Includes support for genlock, captions, timecode burn-in, override, audio channel mapping, and metadata labels and variables. Record any source into growing files for instant, ongoing delivery to any production or processing workflow. Record and share edit-ready formats with Avid Media Central, Avid Interplay, Adobe Premiere, Switch, Vantage Social Media Connector, Apple Final Cut Pro and more. 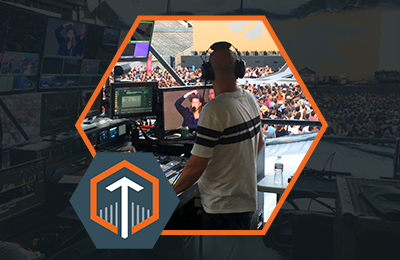 Lower turnaround times for clips, highlights or promo packages in live and post-production environments. 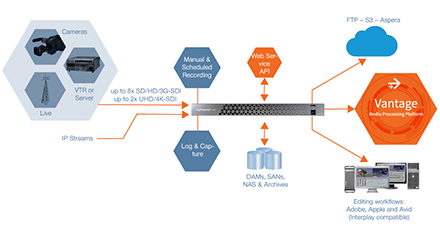 Easily manage multiple SDI-connected VTR decks in the GUI or using hot-key based transport controls. Control decks and capture actions remotely via the Web Services API. Built-in scheduling, triggering and automation features allow for set-it and forget-it capture and ingest workflows. 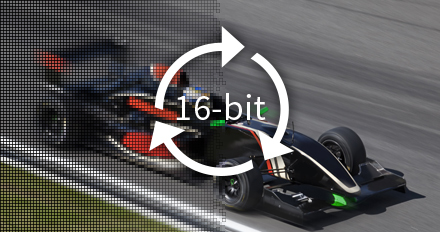 60-second time-shift buffer means you won’t miss any critical footage, and error-resistant whole-tape ingest means you will capture the entire tape without interruption, even if it is damaged or missing information. 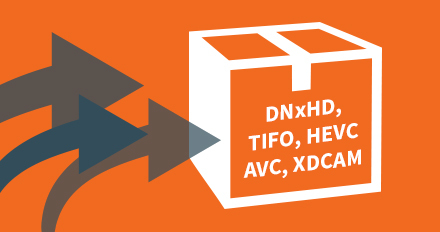 Easily define and bind capture variables, populate labels for downstream actions. Never lose a bit. Superior, real-time video signal processing inherited directly from our industry-leading media processing platform, Vantage. Lightspeed Live Capture processes video in 16-bit space to preserve the highest quality assets and adhere to source material with complete accuracy. Future-ready for UHD, HDR, WCG, SMPTE 2022 processing requirements. Create Live Capture and Tape Capture origin actions in the Vantage Workflow Designer to initiate smart, automated media processing workflows within a corresponding Vantage domain. Seamlessly and efficiently condition your media for contextualized viewing windows with correct branding, ads, captioning, ABR packaging, etc. from all from a single capture event. 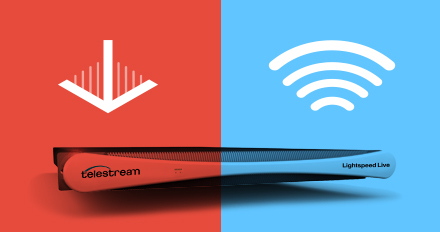 Lightspeed Live Capture can be combined with Lightspeed Live Stream to encode and stream multiscreen ABR OTT content to multiple destinations on the web. 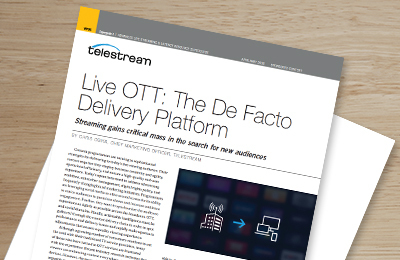 Deliver live HLS, MPEG-DASH, and RTMP streams directly to CDNs or publish to social media platforms like Facebook Live and YouTube Live, while capturing mezzanine quality files into open workflows. Includes support for multichannel publishing, IDR frame insertion, SCTE-35/104 compatibility, programmatic control, and more.